"Diana and family, so sorry to hear of Mac's passing, he..."
"Remembering Fred, part of the "Cady Rd. Gang" I grew-up..."
"Wishing you peace to bring comfort, courage to face the..."
"Fred as we new him from childhood. The world was touched..."
Phillip (Mac) Fred McAlister, Jr. Phillip (Mac) Fred McAlister, Jr., 62, died July 26, 2015 after a courageous battle with an insidious disease. He was born on February 8, 1953 in Everett, Wash., the eldest of three siblings. 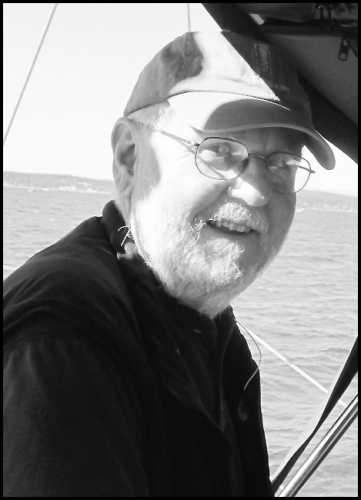 He graduated with a BA from CWU in 1980 and loved working as a graphic artist for Puget Press Multiple in Everett for 30+ years. He subsequently worked at Electric Mirror in S Everett, enjoying a very positive workplace. In 1977, he married Diana Lynn Downing of Soap Lake, Wash. He is survived by his wife and daughters, Becky (Mike) Jolly, Debra (Eric) Schwulst, Bethany (Jarid) McCool and Kaitlyn (Greg) Cope, as well as 10 grandchildren, Makayla, Micah-Mae, Manesseh Jolly, Gideon, Judah and Lydia Schwulst, Braden and Jaxon McCool and Elizabeth and Olivia Cope. In addition, his parents, Phil and Gay McAlister of East Wenatchee; sister, Cindy Hoyden and brother Mike (Monica) McAlister both of Everett and their children survive him. Mac's character was first formed by his Grandmother Hinds, who took him regularly to Sunday School. There, "Freddy" met Jesus at age 3. He learned his love of solitude, sitting for hours in the fishing boat with his grandfather. His artistic eye for design, line, shape and texture grew from his time in his grandparents' care. "Fred", as a youth in south Everett, had friends that explored music in Portland and dropped out to NE Washington to "live off the land". He loved hiking the high trails and building habitats. He worked for the Forest Service and decided he didn't want to make his living working in a mine or logging. He landed in Rock Island where he was introduced to his future wife, Diana. "Mac's" graduation from college prepared him for a professional job, creating copy for a print firm. His clear and crisp portfolio won him the job. His workmanship rose in high regard. Mac researched technology and navigated this quickly developing field, enjoying podcasts and tech magazines. (One techie like-minded son-in-law has come into a new appreciation of him in this area.) Mac saw himself as a realist. He thought the optimists of the world (his wife) saw realists as pessimists. He dealt with reality in ways that brought Peace and Comfort, demonstrating a faith in the Truth for the ages. He believed all conflict was resolvable between reasoned sons of God. Mac's love of the sea came from sailing. He communed with God while near or on the water and that built his awe of how big was his God, how vast, how powerful. A quiet man, Mac's subtle wit resulted in everyone listening carefully when he spoke. The result was either profound or hilarious. When Mac corrected his children, his kindness encouraged them to be better than they were. They knew his unconditional love. They didn't have to prove themselves to him. Out of Mac's consistent heart of kindness, his others in the family grew to trust in a heavenly Father. One child and one son-in-law testify of learning the Father in heaven because of Mac's character. In the crisis of this disease, Mac believed the promises of God. At one point early on, he knew his time was coming and he asked God for more time. His family had an additional year beyond his prayer. Phil's faithfulness and gentle kindness drew the quiet ones. He played guitar, and about any other instrument he picked up. Sailing, hunting chantrelles in "no-tellum-mushroom-patch" and his passion for computers and techie stuff filled his free time. The celebration of his life will be Friday, July 31, 2015 at 1 p.m. at Bryant Community Church, Arlington followed by a reception with light refreshments. In lieu of flowers, which wither and die, three organizations that agree with the values Mac held are Family Academy, a private school supporting homeschooling families, Bryant Community Church of Arlington, his home church for 35 years and Seattle Cancer Care Alliance's Family Assistance Fund. Each of these agencies changed his life.